I seem to have cast on again. That's the beginnings of Tussie Mussie, designed by Cari at Dogs Steal Yarn. My other sweater, Arwen, has gone back into hibernation. I've never finished an adult sweater before, and although I love Arwen, it's construction is definitely non-traditional. I decided I might be better off beginning with something with a more regular construction. And I love the "nosegays," especially on the sleeves! 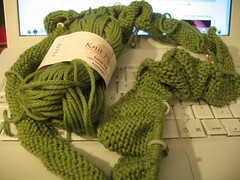 I'm knitting it out of KnitPicks Swish DK in Asparagus. It's superwash wool, and I'm really liking it. And I'm almost ready to start knitting the nosegays on the front! That green will look great on that sweater! My google reader keeps telling me this post is new. perhaps it wants me to admit that I too have cast on.